Tears welled up as I threw away my first bottle of prenatal vitamins. Three months had gone by and it was empty – I still wasn’t pregnant. So instead of heading to the store to pick up a pregnancy test, I was on my way to pick up my prescription vitamins, the ones my doctor told me to take, and I thought it was all I needed to do. If only I had known how much of a difference changing my nutrition would make in my reproductive health! If only I had known how much Vitamin A and fertility were linked. This fat-soluble vitamin plays an important role in supporting many functions of the body and is available to us in two forms: retinol and carotenoids. The retinol, or active form of the vitamin, is found only in foods that come from animals (meat, milk, eggs, liver). Carotenoids (the most common being beta-carotene) is found in plants, specifically orange vegetables and dark leafy greens. There are ample food sources to ensure that, with a proper diet, food sourced vitamin A should be sufficient for most. But many people don’t eat near enough foods that contain vitamin A and your fertility may suffer because of it. 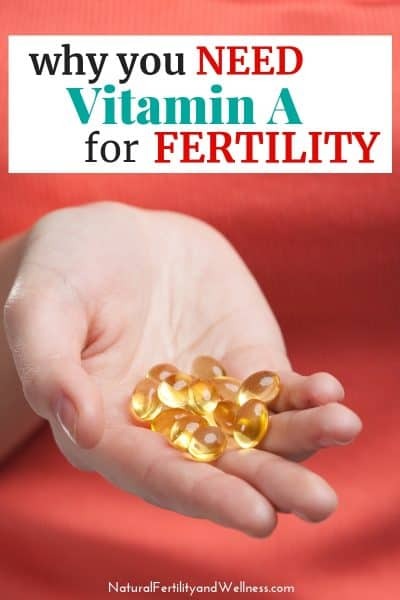 If you’re struggling with infertility it’s possible that you are one of the 15% of Americans who has a vitamin A deficiency as a contributing factor. What does Vitamin A do in the body? plays a role in immune function and skin health. Vitamin A is also a crucial component of fertility health. Traditional cultures actually used to give couples, especially women, certain foods that were thought to increase fertility. It was quite common for them to reserve special foods for women about to be married as well as for newlyweds, sometimes even holding marriages only during the summer when these foods were plentiful. Dr. Weston A. Price, a dentist that traveled the world researching why the Western world had a massive issue with tooth decay, ended up figuring out why these people groups also had robust fertility rates as well as children that grew up with cavity free straight teeth. He did multiple studies all over the world and found that in cultures with very fertile women and healthy strong babies, they were fed diets high in fish, organ meats, and butter from grass-fed cows. While these people had no scientific research to back how they ate (and were pretty much isolated from the industrial world), they knew which foods would give them healthy, strong bodies that conceived easily and birthed healthy babies. The foods that were so important to them were also high in Vitamin A. This essential nutrient can help support a woman’s fertility in many ways, most noticeably is that it promotes better cervical fluid. Not only can it help your body to produce more fluid (making it easier to figure out Natural Family Planning) but the fluid itself is more nourishing for the sperm and helps them to live longer, allowing for more time to fertilize the egg. Vitamin A also assists the follicles in maturing properly. Both in the maturation of an egg and then in assisting the follicle in producing the hormones needed to aid the fertilized egg into the uterus. So if your body is low on vitamin A, a follicle may not be able to function correctly. As an antioxidant, Vitamin A is important for protecting the sperm from free radical damage which can then decrease the risks of infertility and miscarriage. Beta-carotene has also been shown to help improve sperm quality and motility. Both forms of Vitamin A are important for our health. However, the animal-based version is considered the active form that is ready to be absorbed and used by the body. Plant-based beta-carotene is actually considered a pre-vitamin in the aspect that your body must convert it in order to be utilized by cells, but this conversion will vary based on a person’s health and age. You may actually have to consume about six times more beta-carotene than retinol to absorb the same amount of Vitamin A. For this reason, while plants are an amazing source of nutrients and offer many health benefits, we shouldn’t solely rely on them for our Vitamin A consumption. A combination of animal foods like butter, eggs, and even organ meats along with ample Vitamin A-rich plants will ensure that you’re getting enough of this important nutrient to support your reproductive health and fertility. If you don’t consume animal products at all, seem to be low on cervical fluid and have a hard time charting cervical fluid for natural family planning, or have been trying to get pregnant for a while without success, you may want to think about adding a real food supplement, such as cod liver oil, to your diet along with your normal prenatal supplement. CAUTION: You can get too much Vitamin A, especially when taken in synthetic supplement form! In excess of 10,000 IU’s a day, the synthetic version of vitamin A has shown to increase the chances of birth defects as well as cause health problems. Dr. Price found that many cultures consumed much more than this through whole foods and it’s thought that this was safer as the foods also contained Vitamins D and K2, which are cofactors with Vitamin A. It’s important to consume Vitamin A in foods rather than supplements whenever possible. For more food sources of vitamin A, check out World’s Healthiest Foods list. As you can see, Vitamin A is super important for our fertility, but just as importantly, it’s also necessary for proper fetal development! For this reason, it’s important to begin eating a well-rounded fertility diet at least 3-4 months before trying to conceive. And yes, I do still take prenatal vitamins (though I’ve done a bit more research about them and switched brands! ), but my goal now is to get most of what my body needs from food. Nature knows best! It’s amazing that you mention codliver oil specifically. I’ve been wondering recently whether my charting became easier because I knew more what I was looking at, or if it really was different/more obvious stages. But I’ve been on cod liver oil for something else, for a couple of months now, so perhaps that answers the question. I might have to try this. Thank you for the information. zebe – I too noticed a huge change when I changed my diet to eat whole foods and little to no processed. One of the biggest differences for me though came after I switched from low fat dairy and meat products, to the normal/regular fat, God given ones. The naturally occurring vitamin A must be absorbed so much better than the supplements I was taking before. Thanks for the info!! I know just the person to forward this to. Sometimes if my diet does not include vitamin A through out the day I compensate Daily value of vitamin A with juices. You mentioned liver… I’m trying, really I am. Does chicken liver count? My husband said he’d try pate if I made it from good chicken livers. Beef… ugh, just not there yet. And liver is a hard one to swallow…literally! I can do it if someone else makes it, or I put just a small amount in some ground beef. otherwise….not so much. Thanks for your helpful site! I was always thin as a model, beacuse I liked to be so. My BMI was 16 and my body fat was 11. Despite of a very low body fat I had always my periods because I ate a lot, a lot of fruits and vegetables. We are designet to eat a lot of natural vitamins to function well. Now I have a challenge as a vegan to rise my BMI and BF in order to get pregnant :).